The day after the CrisisMappers 2011 Conference in Geneva, my colleague Phoebe Wynn-Pope organized and facilitated the most important workshop I attended that year. She brought together a small group of seasoned crisis mappers and experts in protection standards. The workshop concluded with a pressing action item: update the International Committee of the Red Cross’s (ICRC) Professional Standards for Protection Work in order to provide digital humanitarians with expert guidance on protection standards for humani-tarianism in the network age. My colleague Anahi Ayala and I were invited to provide feedback on the new 20+ page chapter specifically dedicated to data management and new technologies. We added many, many comments and suggestions on the draft. The full report is available here (PDF). Today, thanks to ICRC, I am in Switzerland to give a Keynote on Next Generation Humanitarian Technology for the official launch of the report. The purpose of this blog post is to list the protection protocols that relate most directly to Crisis Mapping & Digital Humanitarian Response; and to problematize some of these protocols. In light of the rapidly proliferating initiatives to make new uses of information technology for protection purposes, such as satellite imagery, crisis mapping and publicizing abuses and violations through social media, the advisory group agreed to review the scope and language of the standards on managing sensitive information. 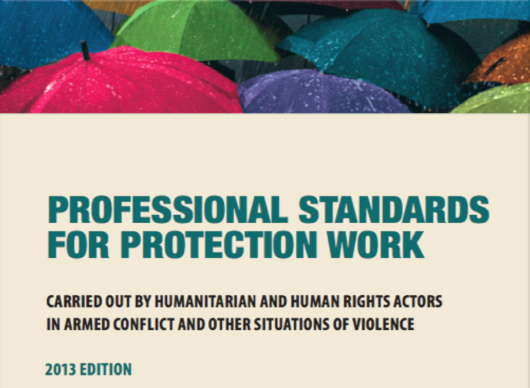 The revised standards reflect the experiences and good practices of humanitarian and human rights organizations as well as of information & communication technology actors. The new and most relevant protection standards relating—or applicable to—digital humanitarians are listed below (indented text) together with commentary. A number of Digital Humanitarian Networks such as the Standby Volunteer Task Force (SBTF) only collect crisis information specifically requested by the “Activating Organization,” such as the UN Office for the Coordination of Humanitarian Affairs (OCHA) for example. Volunteer networks like the SBTF are not “protection actors” but rather provide direct support to humanitarian organizations when the latter meet the SBTF’s activation criteria. In terms of what type of information the SBTF collects, again it is the Activating Organization that decides this, not the SBTF. For example, the Libya Crisis Map launched by the SBTF at the request of OCHA displayed categories of information that were decided by the UN team in Geneva. These international, regional and national rules, principles and laws need to be made available to Digital Humanitarians in a concise, accessible and clear format. Such a resource is still missing. Interestingly, when OCHA activated the SBTF in response to the Libya Crisis, it was the SBTF, not the UN, that took the initiative to formulate a Threat and Risks Mitigation Strategy that was subsequently approved by the UN. Furthermore, unlike other digital humanitarian networks, the Standby Task Force’s “Prime Directive” is to not interact with the crisis-affected population. Why? Precisely to minimize the risk to those voluntarily sharing information on social media. of the information collection process, in relation to the intended use of the information collected. Again, this is determined by the protection actor activating a digital humanitarian network like the SBTF. Protection actors should systematically review the information collected in order to confirm that it is reliable, accurate, and updated. Protection actors should be explicit as to the level of reliability and accuracy of information they use or share. Networks like the SBTF make explicit whether a report published on a crisis map has been verified or not. If the latter, the report is clearly marked as “Unverified”. There are more nuanced ways to do this, however. I have recently given feedback on some exciting new research that is looking to quantify the probable veracity of user-generated content. Objective, impartial, non-discriminatory and unbiased information is often more a fantasy than reality even with traditional data. Meeting these requirements in a conflict zone can be prohibitively expensive, overly time consuming and/or downright dangerous. This explains why advanced statistical methods dedicated to correcting biases exist. These can and have been applied to conflict and human rights data. They can also be applied to user-generated content on social media to the extent that the underlying demographic & census based information is possible. To place this into context, Harvard University Professor Gary King, reminded me that the vast majority of medical data is not representative either. Nor is the vast majority of crime data. Does that render these datasets void? Of course not. Please see this post on Demystifying Crowdsourcing: An Introduction to Non-Probability Sampling. to any collection of information, to ensure protection from loss or theft, unauthorized access, disclosure, copying, use or modification, in any format in which it is kept. One of the popular mapping technologies used by digital humanitarian networks is the Ushahidi platform. When the SBTF learned in 2012 that security holes had still not been patched almost a year after reporting them to Ushahidi Inc., the SBTF Core Team made an executive decision to avoid using Ushahidi technology whenever possible given that the platform could be easily hacked. (Just last month, a colleague of mine who is not a techie but a UN practitioner was able to scrape Ushahidi’s entire Kenya election monitoring data form March 2013, which included some personal identifying information). The SBTF has thus been exploring work-arounds and is looking to make greater use of GeoFeedia and Google’s new mapping technology, Stratomap, in future crisis mapping operations. Protection actors must integrate the notion of informed consent when calling upon the general public, or members of a community, to spontaneously send them information through SMS, an open Internet platform, or any other means of communication, or when using information already available on the Internet. This is perhaps the most problematic but important protection protocol as far as digital humanitarian work is concerned. While informed consent is absolutely of critical importance, the vast majority of crowdsourced content displayed on crisis maps is user-generated and voluntarily shared on social media. The very act of communicating with these individuals to request their consent not only runs the risk of endangering these individuals but also violates the SBTF’s Prime Directive for the exact same reason. Moreover, interacting with crisis-affected communities may raise expectations of response that digital humanitarians are simply not in position to guarantee. In situations of armed conflict and other situations of violence, conducting individual interviews can put people at risk not only because of the sensitive nature of the information collected, but because mere participation in the process can cause these people to be stigmatized or targeted. by individuals should remain alert to any negative repercussions on the individuals or communities concerned, owing to the actions they have taken, and take measures to mitigate these repercussions. Part of this protocol is problematic for the same reason as the above protocol. The very act of communicating with victims could place them in harm’s way. As far as staying alert to any negative repercussions, I believe the more seasoned digital humanitarian networks make this one of their top priorities. When handling confidential and sensitive information on abuses and violations, protection actors should endeavor when appropriate and feasible, to share aggregated data on the trends they observed. The purpose of the SBTF’s Analysis Team is precisely to serve this function. Protection actors should establish formal procedures on the information handling process, from collection to exchange, archiving or destruction. Formal procedures to archive & destroy crowdsourced crisis information are largely lacking. Moving forward, the SBTF will defer this responsibility to the Activating Organization. Although the need for caution is a central message [in the ICRC report], it should in no way be interpreted as a call to avoid sharing information. On the contrary, when the disclosing of protection information is thought to be of benefit to the individuals and communities concerned, it should be shared, as appropriate, with local, regional or national authorities, UN peacekeeping operations, other protection actors, and last but not least with service providers. This is inline with the conclusions reached by OCHA’s landmark report, which notes that “Concern over the protection of information and data is not a sufficient reason to avoid using new communications technologies in emergencies, but it must be taken into account.” And so, “Whereas the first exercises were conducted without clear procedures to assess and to subsequently limit the risks faced by individuals who participated or who were named, the groups engaged in crisis mapping efforts over the years have become increasingly sensitive to the need to identify & manage these risks” (ICRC 2013). It is worth recalling that the vast majority of the groups engaged in crisis mapping efforts, such as the SBTF, are first and foremost volunteers who are not only continuing to offer their time, skills and services for free, but are also taking it upon themselves to actively manage the risks involved in crisis mapping—risks that they, perhaps better than anyone else, understand and worry about the most because they are after all at the frontlines of these digital humanitarian efforts. And they do this all on a grand operational budget of $0 (as far as the SBTF goes). And yet, these volunteers continue to mobilize at the request of international humanitarian organizations and are always looking to learn, improve and do better. They continue to change the world for one map at a time. I have organized a CrisisMappers Webinar on April 17, 2013, featuring presentations and remarks by the lead authors of the new ICRC report. Please join the CrisisMappers list-serve for more information. This entry was posted in Crisis Mapping, Crowdsourcing, Social Media and tagged data, ICRC, Protection, Protocols, Standards. Bookmark the permalink. Good post, Patrick. What worries me, and keeps me up at night, is not just consent, but INFORMED consent. When we gather data — even when it is willingly provided by victims of conflict; even when we are collecting the data for a “good” purpose — we have to be aware of consequences at all times. Can we ask a person to risk their life? How do we know that the risks are well understood by the witness to a crime against humanity? Situational awareness tends to be lacking locally as well as from a safe distance of data aggregators. How do we get a true informed consent? Is it even possible? Thanks very much, Olga. Yes, there’s an entire section on “Informed Consent” in Chapter 6. And the chapter also makes clear that we have to be aware of consequences at all times. As noted in my blog post, there is indeed some tension re the need for truly informed consent and minimizing harm. The ICRC’s take on that question is to recommend to proceed only if the expected benefits outweigh the expected costs. Loved your presentation yesterday and was completely inspired by the possibilities for protection work….. Thanks! Thanks for your kind words, Rachel! Please do keep in touch and let me know if I can ever be of service. Reblogged this on Speed Evidence Project.